Calvary 1914-18 1939-45 St. Michael R.C. St. Michael’s Roman Catholic Church DH7 9QN. 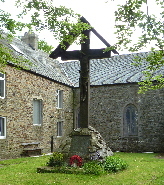 Calvary with gabled top on stone mound. Set into the side of the mound is a stone plaque 2 feet 7 inches high x 2 feet 3 inches wide resting on a stone pedestal. This bears the names from 1914-18 in two columns. Set in front and below this is a stone plaque 6 inches high x 2 feet wide x 2 inches deep which bears the names from 1939-45. The Prayer at the top of the larger plaque is in Gothic lettering. The rest of the lettering is in elaborate capitals. Wood Calvary, stone pedestal. polished granite plaques. b. 2 names, ranks and regiments. Leaning slightly due to insecure foundations.